Nautical by Nature: Tipsy Skipper Giveaway! The winner will receive the Tipsy Tote in "That's a Crock!" Don't you just love the matching skimmers?! Comment #1- I love the Fleur-de-Sea ballet flat in the Mon Cherie pattern! Comment 3: I am already following your blog and I love to read it! I LOVE MY DOGS AND MY DOGS LOVE YOUR COLLARS!!! The ballet flats Tippler in the Purple Flirt pattern. I love the flambe print. Lovely! i love the captain morgan clutch in "leaf it to me"
Comment #1 - I love the ballet flats, tote bags, and floor cloths. My favorite pattern is the Fleur de Sea! I love it!! Such a great giveaway- so appropriate for any nautical prep! I love love lover their ballet flats - my favorite is the Mon Cheri print. It's super cute and a great color combo. Please count me in for 2 entries! I looove Fleur de Sea in Mon Cherie! So cheery! I liked Tipsy Skipper on Facebook! I follow the Tipsy Skipper blog! Love, love, love the totes! Love the idea of matching tote and classic flats. Already a fan on facebook, and a follower of Nautical by Nature! I like the dog collar in Go Fish (Tree Hugger)! I follow (and love) your blog. LOVE the fleur-de-sea ballet flats in snow shoe grog!!! super cute. I already follow your blog and I just "liked" Tipsy Skipper on Facebook. Oh I love this bag so much!! It's my favorite pattern, That's a Crock in Flambe! I love the flats in this pattern as well :) I follow Nautical by Nature, the Tipsy Skipper Blog, and like Tipsy Skipper on facebook! 4 entries please! I love the thats a croc print in the tote...very cute. I love love love everything in the Fleur De Sea print!! I "like" tipsy skipper on FB! hard to bpick, they are both adorable. but i think i would have to go with the that's a croc pattern. SO cute! love the clutch in go fish-hot damn! oh and I blogged about the giveaway! my favorite item, felur-de sea tote. I follow and love this blog! Very cool! Loving her items. I think the Fleur-de-Sea, in Snow Shoe Grog, are my fav items (they are flats)! I also follow both blogs! I love the Tippler in the Purple Flirt -- it is amazing and fits my nautical life! I love the "that's a croc" in flambe and the go fish! in treehugger pattern. Happy blog-iversary! I became a follower of the Tipsy Skipper! Love the flats and will be ordering key fobs for stocking stuffers (Petal to the Metal in avocado & scrubs). I'm follower #13 on Tipsy Skipper's blog. I liked Tipsy Skipper on FB. I've followed and enjoyed your blog via GFC for a while now. I love the The Captain Morgan Clutch in Go Fish! & the Skipper Skimmers in That's a Crock - in Flambe - - it's a close call as to which one I love more. I've been following Tipsy Skipper on Twitter & Facebook for a long time - and now I am following her blog as well. I am now following your blog - I love it by the way, so glad to have found it! And finally I will tweet about this great giveaway! I love the Petal to the Metal (in Avocado) floor cloth. now following their blog too. I love the that's a crock print in flambe. Ohhh, what fun and pretty things! The matching tote and skimmers are adorable, and I love the dog collars, too! I "Like" Tipsy Skipper on Facebook! I love the ballet flats in the patter "Flambe," what a lovely coral color! Ohhh! I love the ballet flats in "Thats A Croc!". So cute. And what a sweet giveaway! Thanks! 2.) 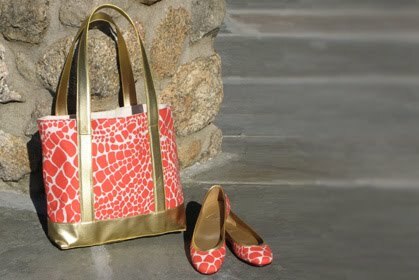 I love the "Thats a Croc" set and the "Fleur de Sea" pattern in the bag & flats! i LOVE the bag, as well as the flats in fleur-de-sea! I like TS on Facebook. All the ballet flats are adorable, but I think I like the "Fleur-de-Sea" in Apres' Ski, so cute! I loooove Tipsy Skipper and I've had my eye on the ballet flats in Flambe for a few weeks now! I like Tipsy Skipper on FB! Sign me up! I love the Fleur de Sea! 1. LOVE almost all of the ballet flats but Tippler, in Purple Flirt is my fave. 2. I follow your blog! 3. I blogged about your giveaway. I love the ballet flat in the That's a Crock and Fleur de sea patterns! I couldn't narrow it down to just one favorite!